One-On-One Conversations with industry leaders Alien Technology and Cellotape Smart Products. 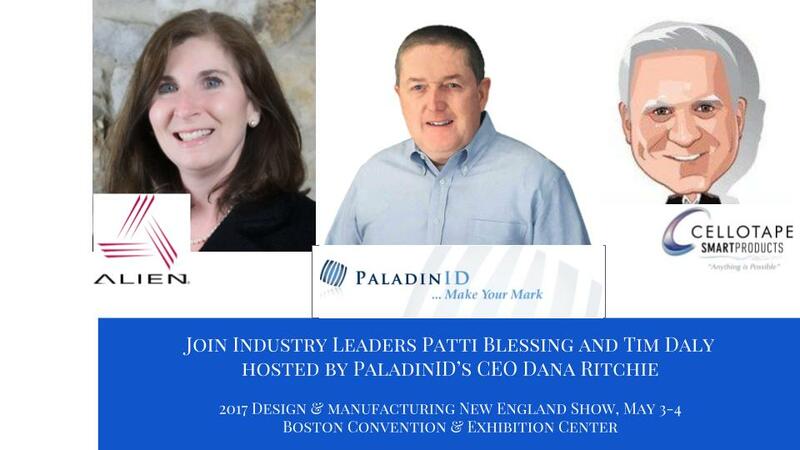 Boston, MA, April 28, 2017	(Newswire.com) - PaladinID hosts unprecedented live RFID demonstrations and one-on-one conversations with Alien Technology's Patti Blessing (Director Business Development), Tim Daly (President, Cellotape Smart Products) and Dana Ritchie (PaladinID CEO). Learn about how RFID plays an important role in Biotech, Pharmaceutical/Biomedical, Medical Devices and the related Industrial Manufacturing segments at Booth #1033 at the Design & Manufacturing New England Show held at the Boston Convention Center. For Real-Time RFID #tracking and #authentication PaladinID invites show attendees to participate in The Great #12 Brady Jersey Hunt and enter for a chance to win a #12 Patriots Jersey! PaladinID develops and supports high-performance bar code labeling applications. We work with our clients to "Make Your Mark" by providing the expertise and tools necessary to create an entire product label printing solution. Alien Technology - Alien solves the Identification of Things™ (IoT) through the provision of UHF passive RFID transceiver chips, tags, inlays & labels, fixed & mobile readers and a full range of related professional services. These solutions are implemented in industries such as consumer packaged goods, retail apparel, manufacturing, transportation, airports and cargo logistics, government and defense, and more. Alien's facilities include corporate headquarters in San Jose, CA; the Alien RFID Solutions Center in the Dayton, OH region; and a sales office in Shanghai, China. Cellotape Smart Products - With over 60 years of expertise, and located in the heart of Silicon Valley, Cellotape Smart Products is the leader in creating products that integrate NFC and RFID - "RF technologies," allowing for frictionless two-way communications between the physical and digital worlds and access to the cloud. At PaladinID, we are labeling experts. With our knowledge and unique experience, we provide the best solutions and offer unmatched value to our customers. Give us the opportunity to work with you. Using #RFID #track and #trace locate the Patriot jersey real-time and enter for a chance to win a #12 Brady jersey.